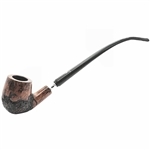 Luca Vanetti Billiard 9mm Pipe - Straight stem with a decorative brass ring, this Italian Luca Vanetti briar pipe is a classic billiard bowl in a warm brown color finished with a very fine polish. 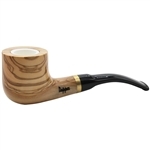 Made in Italy, the pipe is stamped "Luca Vanetti Italy" on the shank. 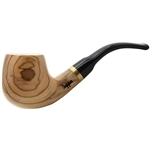 Luca Vanetti handmade pipes are Made in Italy of high quality briar at a remarkably affordable price. 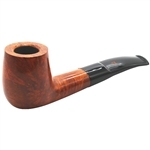 All Luca Vanetti pipes are 9mm filtered pipes and are still a great smoke with or without using a 9mm filter. A velvet Luca Vanetti logo drawstring pouch is included.